to Bandra - Queen Of The Suburbs. Bandra has had many local newspapers in the past, that catered to the local need of providing community content. However, since about three years, there's been a long gap of any good local publication. To fill this void, Bandra Buzz was launched by a team of like-minded Bandraites - with a common aim of creating a 'Better Bandra'. 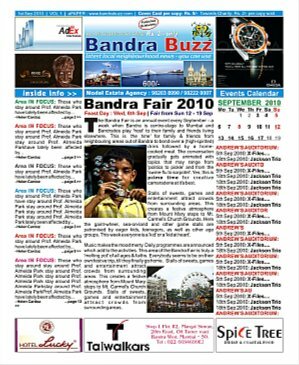 Bandra Buzz is a 24 multi-colour pages local newspaper - the page size of Mumbai Mirror, with a circulation of over 10,000 copies in and around Bandra.